The Strider brand is arguably the most trusted name in the balance bikes market. Over the years, they have managed to build a brand that is synonymous with a high-quality biking experience in the US and many other countries. 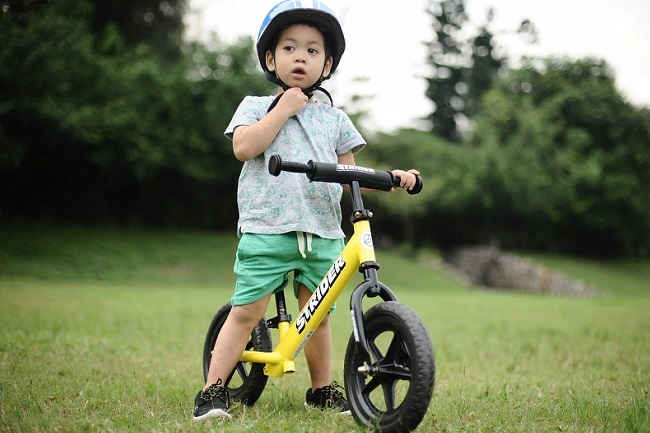 Even with a steady influx of competition in the arena, Strider 12 Sport No Pedal Balance Bike continues to be the brand that parents and children relate to the most today. Designed for a young starting age. An 18-month old child can start on this bike. Strong brand recognition. Kids will be proud to own this and will love you for getting it for them. Comes with a mini seat for children aged 18 to 36 months as well as an extra long seat for kids in the age bracket of 36 to 60 months. Amazingly adjustable seat and handlebar height. It provides the kids with a smooth and quick transition to a pedal bike like no other. There are really no drawbacks to report on the Strider 12 apart from a couple of users reporting some problems with the seat not being adjustable. These were just incidental occurrences. The Strider 12 Sport No Pedal Bike is without a doubt the balance bike in the spotlight. The unique style quotient and user-friendly reputation help it score way above the competition. The Strider 12 has been designed for the youngest age bracket. Basically, it means that if the kid can walk, he or she can ride. This is the selling point of the Strider 12 Sports No-Pedal Bike. For starters, the aluminum frame is almost space age, making the Strider 12 practically lighter than a feather facilitating greater speeds and better balance. One aspect that all parents complain about their best balance bikes is the wheel quality. They constantly have some repairs to be done or keep falling off. With the Strider 12, you face no such problem. Extremely lightweight and built for longevity, the wheels are something you will not be worrying about. The mini-saddle design makes a perfect fit for toddlers providing all the support and comforts your child would require. There is no need to bring in your toolkit to adjust the height of the handlebars and seat. Your children can practically do it themselves! Handlebar injuries are a thing of the past with the Strider 12. Specially designed safety pads on the handlebar ensure the lowest possible risk from this. The bike comes with a bonus XL seat designed for kids up to 5 years old. This means you have a long-term investment that is safe and provides an enjoyable riding experience for your children. To sum it up, the Strider 12 Sport No-Pedal Balance Bike is the best bet you would make when it comes to getting your toddler his or her first bike. At the price offered and with the amazing features incorporated into this stylish balance bike, you really have no reason to choose anything else.